Thank You For Your Purchase Of BOOST ME! STOCK UP ON BOOST ME AND SAVE UP TO 72% OFF! Increase overall health with this combination of powerful protein and the vitamins, minerals and antioxidants found in SuperFoods like coconut oil, pineapple, sweet potatoes, salmon skin, pumpkin, blueberry pomace, beet pulp and carrots! The ideal raw food diet for dogs. 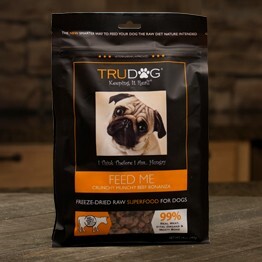 Made and sourced in the USA from the highest quality cuts of beef meat, organ, bone and blood. No grains, no fillers, no by-products, no meal proteins, no added ANYTHING! Just simple, powerful, raw nutrition. 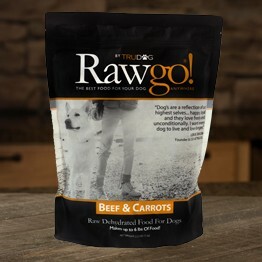 The first dehydrated raw food to live up to TruDog standards, Rawgo combines powerful protein with the health benefits of wholesome herbs and veggies. No grain, fillers or by-products. 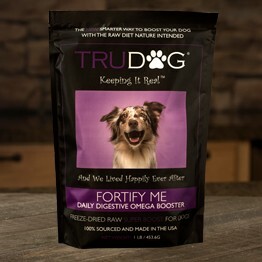 Formulated by holistic vets and canine nutritionists. ©2019 TruPet LLC. All rights reserved.